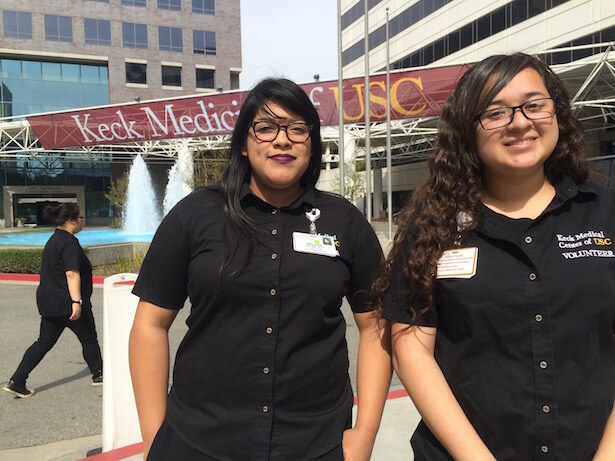 Francisco Bravo Medical Magnet students Melanie Cruz, left, and Francis Covarrueias outside the Keck School of Medicine of USC. This is part of a series looking at the different types of schools that make up the Los Angeles Unified School District. As part of our examination of magnets, LA School Report visited Francisco Bravo Medical Magnet to learn what makes it one of the top schools in the district. A nondescript building next to the sprawling campus of the Los Angeles County+USC Medical Center hides one of LA Unified’s greatest accomplishments. The building could easily be passed over as a radiology center or an administrative center, as there are no athletic fields or obvious indicators other than a small sign out front to let passersby know it is in fact a high school. And it is not just any high school. The Francisco Bravo Medical Magnet, home to more than 1,800 students, is considered one of the best in the district and the state. While many LA Unified schools struggle to meet the challenge of educating students from low-income households, Bravo year after year demonstrates that these students can be among the district’s top performers. The school, which is adjacent to the USC medical complex, is on pace to have one of the top five graduation rates for the district this year, was a 2006 National Blue Ribbon winner and was ranked in 2015 by U.S. News & World Report as the 44th best high school in California and 239th best in the nation. It has achieved all this despite the fact that 90 percent of its students qualify for a free or reduced-price meal, a number higher than the district’s already-high average of 77 percent. Students, teachers and administrators give many different answers for what makes Bravo successful: It’s the commitment of the counselors, the dedication of the teachers, the high standards set by administrators, the culture the students create. The multitude of answers makes sense, because asking why all schools can’t be like Bravo is like asking why all movies can’t be as good as “The Godfather.” If it was easy, everyone would do it. Jocelyn Kang, a senior at Bravo, credits the overall academic culture and how it permeates all aspects of the school. Bravo started as a magnet program within Lincoln High School in 1981. 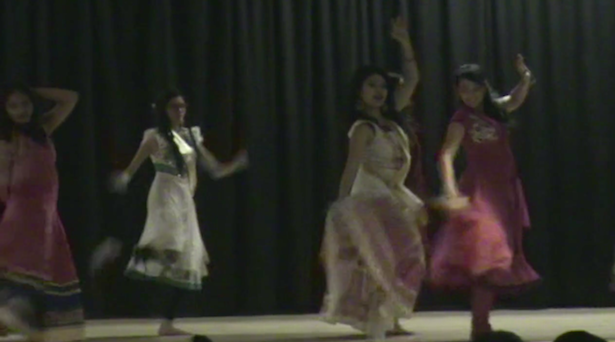 In 1990, the program became a full school and moved into its current building, which was built specifically for the school. Bravo was the first new school opened at LA Unified in 17 years and the first stand-alone magnet school. Eighty-three percent of Bravo students were enrolled in AP courses in 2014-15, compared to just over 20 percent for the district as a whole. Eighty-six percent of Bravo’s juniors met or exceeded the standards on the 2015 Smarter Balanced English Language Arts test, compared to 33 percent for the district, 39 percent for its independent charters and 44 percent for the state. On the math test, 52 percent of Bravo students met or exceeded the standards, compared to 25 percent for the district, 28 percent for charters and 33 percent for the state. One thing helping Bravo’s test scores is its low level of English learners, as LA Unified has struggled to meet the needs of these students. Two percent of Bravo’s students are English learners, while the district average is 33 percent. The district’s English learners scored worse than the state average for English learners on the Smarter Balanced tests, with only three percent exceeding or meeting English language standards and only five percent doing so in math. Torres-Flores said the school used to have a waiting list topping 1,000 but it has been reduced to around 700 due to the school increasing its enrollment size. Originally built for 450 students, the school increased its enrollment capacity from 1,705 to over 1,800 around 2010, Torres-Flores said. And despite a big increase in the teacher-to-student ratio as a result of the steady growth, Bravo has been able to maintain its high level of academic success. One thing attracting students to Bravo is the hands-on experience they get at the medical facilities at the USC Medical Center and other nearby USC affiliated facilities like the USC Keck School of Medicine. USC has partnered with Bravo on a number of special programs that are funded through various grants and contributions from USC, government agencies and outside charitable organizations. Through programs like the Engineering for Health Academy, the Science Technology and Research (STAR) program and the Regional Occupation Program (ROP), juniors and seniors at Bravo have the opportunity to work directly with medical professionals in a wide variety of fields, such as biomedical research, physical therapy and radiology. It was opportunities like these that attracted Melanie Cruz, a senior at Bravo from South LA who spends two full periods each day assisting in the USC Sleep Disorders Center. Edwin Valladares, the sleep center’s senior technologist, said he makes sure the students aren’t just doing busy work and tries to gear their activities toward their interests. Jim Bunch has been the Regional Occupation Program coordinator for Bravo the last five years and said the hands-on experience, although it is unpaid, can help beef up a student’s resume as well as help them grow academically. After five years at Bravo, Bunch is beginning to run into students who now have careers at USC after coming through the Regional Occupation Program. One of those former students is Eric Montero, who graduated from Bravo in 2011 and grew up in a nearby neighborhood. Montero partcipated in the ROP program as a senior and now works as a pharmacy tech at the medical center while studying business at East Los Angeles Community College. He said he may want to open his own pharmacy someday. “It’s a really good program. Not everyone likes the medical field, but for the people that would like to join it, the ROP program is a great opportunity to look more into it and see what it really is like to work in a hospital. I felt like that was something that pushed me more forward,” Montero said. Kang, through the Science Technology and Research (STAR) program, assists in a research lab that works with rats to develop drugs that could suppress alcoholism in humans. “Working in a lab, it’s more trial and error and you are not always going to get what you want. You are mostly going to fail in science, that’s what I have learned here,” Kang said. Samantha Delossantos is a senior from Koreatown and works in the same lab as Kang. She is the kind of student that often falls through the cracks at other schools due to family problems and economic challenges. “The lab work, I’m really interested in working with animals and drugs and alcohol because of my personal background. Both of my parents are alcoholics,” she said. Delossantos said she rarely sees her father and lives with her mother and her grandmother. Her mother has been unemployed for several years, so they survive off her grandmother’s pension. She takes the subway and then a bus every day to get to Bravo. Despite these challenges, Delossantos said she is getting good grades and hopes to be accepted to USC where she wants to study to become a pharmacist. She hopes the work they do in the lab could one day help her mother, or others like her. “She wants to stop drinking, but I understand it’s really hard to stop when you are already addicted to it,” Delossantos said. “It’s not like she doesn’t want to have a job, it’s just that she lost motivation, I think, because of alcoholism. I want to try and help her. Not just her, but everyone else. Seventy-nine percent of Bravo’s students are Latino, 10 percent are Asian, 6 percent are white and 2 percent are African-American. While those demographics do not make it an extraordinarily diverse school for LA Unified — where roughly 74 percent of all students are Latino, 9.8 percent are white, 8.4 percent are African-American and 6 percent are Asian — its diversity comes from the many different sections of Los Angeles where its students live. Bravo attracts students from all around the district, including some from as far as San Pedro and the San Fernando Valley. Magnets offer free busing to most high school students who live farther than five miles away. Roughly 85 percent of Bravo’s students arrive by bus. And while a traditional high school typically has students that attended a handful of feeder middle schools, Bravo’s students come to the school from more than 32 different middle schools from around East LA, South LA and other places like Hollywood and Koreatown. Patel, from South Los Angeles, is one of the few Indian students at Bravo but said she does not feel like an outsider. Mirna El-Khalily is from Koreatown and works with Patel in the lab. She is of Egyptian descent and there are few other Egyptians at Bravo, but she also lauded the accepting environment. Torres-Flores agreed that Bravo’s accepting environment is key to helping the students succeed.